ATB 5 oz - Bullion. ATB 5 oz - Tube. ATB 5 oz - Graded. 90% Silver Proof Half Dollars. First Spouse 1/2 oz Gold Coin. Quarter - State Territory Sets. 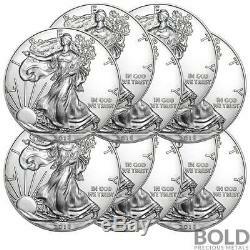 2018 Silver 1 oz American Eagle BU (10 Coins). 2018 American Silver Eagle 1 oz BU (10 Coins). The Silver Eagle is the single most popular bullion coin in the world! Likewise, American Silver Eagles are highly valued as a secure and solid investment. Bullion collectors and investors across the globe prize American Eagles. This value is recognized not only for their stability even in unstable times, but also for their beauty. This beauty is even more appreciated when you closely consider the history and story the design represents. This 2018 American Silver Eagle 1 oz BU (10 Coins) release will certainly add significant value to your silver holdings! Lady Liberty - Graceful, Proud, Strong. Recognized worldwide as one of the most stunning designs in bullion coins, Lady Liberty gracefully, yet proudly represents freedom. She steps into a bright future, draped with a flowing U. Looking toward the rising sun, she recalls that this freedom was won at a great cost. In her left arm she cradles branches of oak and laurel. These symbolize the glory of her people, their strength, and unstoppable resolve. Lady Liberty also extends her right hand in peace unto the Nations of the world. The Eagle - Heraldic, Assured. John Mercanti, the twelfth Chief Engraver of the U. Mint, designed the reverse image in 1986 for the inaugural release. Although similar to the Great Seal of the United States, Mercanti applied his own unique touch. A heraldic eagle with its wings fully outstretched is featured. Also, a striped shield is emblazoned upon its breast. The eagle clutches an olive branch in its right talon, symbolizing peace. Also, in its left talon, it grasps a group of arrows. These represent the costly struggle, which was necessary to establish that peace. The arrows remain firmly clutched to assure that this peace continues to flourish. Thirteen stars arranged above the eagle reflect upon the strong, enduring commitment of the original union of colonies. This is also reflected in the banner held in its sharp beak, distinctively declaring, " E Pluribus Unum , " (Out of Many, One). The American Silver Eagle - A Story for Every Generation. The American Silver Eagle - A Story for Every Generation! Contains 1 Troy oz of. 999 pure silver in BU condition. Singles come in protective plastic flips. Multiples of 20 are packaged in mint tubes. Multiples of 500 are packaged in Monster Boxes. Weinman's design showing Lady Liberty draped in an American flag, walking gracefully as the sun rises over a ridge. Reverse: A heraldic eagle is shown below 13 small stars, representing the original colonies. When first released in 1986, the American Silver Eagle was the only official U. Additionally, the American Silver Eagle was also the only 1 oz silver bullion coin with weight, content, and purity guaranteed by the United States government. The American Silver Eagle quickly soared in popularity worldwide from its very beginning. Across the globe, investors in official government-issued investment grade silver bullion coins continue to choose the American Eagle first. This remarkably striking coin is also a must-have among collectors of fine silver coins. The obverse of the Silver Eagle coins depicts the Walking Liberty design created by Adolph A. This was previously displayed on the Half Dollar coins issued from 1916 to 1947. This Walking Liberty image on the Silver Eagle coin is one of the most cherished and well-known designs ever to grace U. The reverse of the American Silver Eagle coins is just as impressive as the obverse, featuring an American eagle, the very symbol of our nation's freedom, patriotism and national pride. This 2018 American Silver Eagle BU (10 Coins) release continues to bear this high standard proudly into the future! The item "2018 Silver 1 oz American Eagle BU (10 Coins)" is in sale since Monday, January 15, 2018. This item is in the category "Coins & Paper Money\Coins\ US\Commemorative\Modern Silver/Clad (1982-Now)". The seller is "boldpreciousmetals" and is located in Austin, Texas. This item can be shipped to United States.